Best friends Steph Waterman and Kaz Bell share a love for design - and it spans two hemispheres, years of friendship and many apartment makeovers. Together they run The Stylephiles, a multi-platform super-edit of created and curated content, drawing from sources and inspiration from around the globe. Steph and Kaz share with us how they make it all work and prove that if you have passion and determination, anything is possible, no matter how far the distance. A little corner of Steph Waterman's Brooklyn apartment. Styling - Steph Waterman. Photo - Judith Rae. Hi Steph and Kaz, tell us about when the idea was first sparked to start The Stylephiles? Steph: At the time, Kaz and I were both working in different industries, but having both recently purchased our first homes, we were quickly becoming somewhat obsessed with everything in the interiors space. The Stylephiles began as a hub for us to share all of the beautiful interiors inspiration we were finding online, we decided to start our Instagram account over breakfast one morning in 2013. Kaz: We didn’t set out with the intention of creating a successful Instagram brand, but I think it's why it’s worked out that way - it's come from an authentic place of just wanting to share truly beautiful things. We love that we have an outlet to express our passion for good design, boutique travel and our growing love for all things ‘home’. 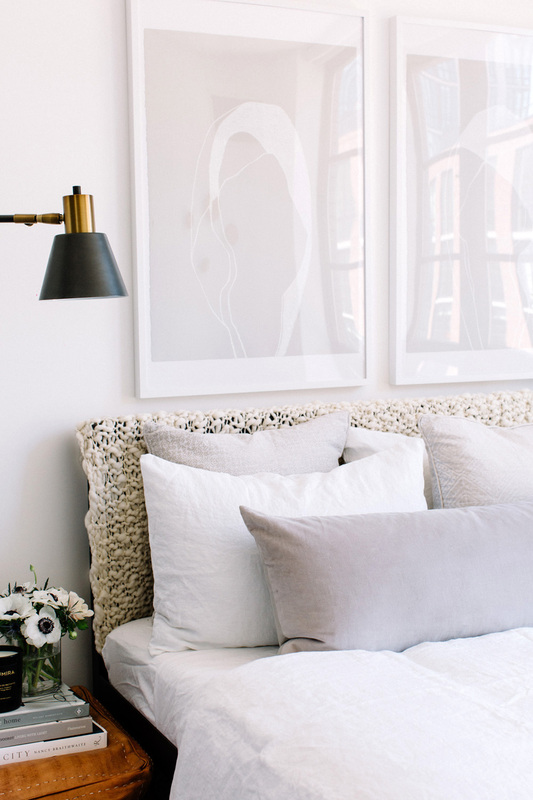 The Stylephiles' Steph Waterman's bedroom in her Brooklyn apartment. Styling - Steph Waterman. Photo - Judith Rae. What’s the best part about working together? Steph: Who wouldn’t want to work with their best friend?! Now that we are separated by a few thousand miles, The Stylephiles keeps us constantly connected as we share what inspires us on a daily basis. Kaz: We met only a year or so before starting The Stylephiles, and through this whole process realised how much we adore each other and our friendship just completely solidified. What inspires you the most? Steph: New designers that are emerging out from under well-known design firms are so inspiring. So much unique talent works under well-known designer’s and when these individuals break out on their own and it’s incredible to see them explore their own creativity under their own name. Kaz: Travel a huge source of inspiration for me. Getting time out to appreciate all we have, physical and mental space to come up with new ideas – and of course seeing the beauty in cities old and new – whether it be the interiors of a completely modern boutique hotel or meandering the streets with ageing tile work in an ancient city. We have quite a big travel element to what we cover on The Stylephiles so sharing our journeys is a real source of joy for me. Steph Waterman and Kaz Bell from The Stylephiles often collaborate over FaceTime to assist in styling each others spaces. Photo - Judith Rae. What does design mean to you? For us, design is a way of expressing your creative self – it means beauty, functionality and style and can and should be applied to every aspect of your daily self. What design does NOT mean to us is expense, you can implement a design aesthetic and channel style on any budget. Steph, you’re based in New York whereas Kaz is in Sydney - how do you make the partnership/business work long distance? Steph: Thank god for FaceTime. This way we can show each other things we're working on and feel like we get to see each other. We always do a mini agenda to make sure we don’t miss a beat as sometimes we can just end chatting about nothing (and everything) and forget what we were supposed to tackle on the call. Kaz: FaceTime and WhatsApp are definitely our lifesavers for keeping communication consistent and timely. As far as keeping our Instagram and Website on track, we utilise a few different web based scheduling tools and have our own systems to keep things running smoothly. What do you love most about your job? Steph: Meeting incredible designers from all over the world and learning about their projects, latest finds and style tricks is what I love the most about what we do. Kaz: Through The Stylephiles, having the opportunity to travel frequently, and to be granted the chance to visit some truly incredible hotels all around the world… that really is the greatest by-product of all our work. The Stylephiles' Kaz Bell and her partner in their Sydney home. Steph - what do you admire most about Kaz? Kaz’s love of color. She is bold and daring with her choices and her home is always bursting with energy as a result. She can also resurrect a dying house plant. Kaz - what’s Steph’s biggest talent? Her determination – you have honestly never met a more fiercely driven person than Steph, she is such a ‘do-er’ and never lingers on an idea. She really whips me into shape! What are you loving at the moment? Steph: Hotel 1 Brooklyn, Croft House Sierra Chair, Ben & Aja EOS Mirror, Mali Mud Cloth anything & the architecture in Sag Harbor. Kaz: The Gubi console table in green marble (anything in green marble really! ), Chin Chin restaurant in Sydney, artwork by Carly Williams, the Terrazzo pieces by Fenton & Fenton (pink side table! ), and the latest season of Great British Bake Off – I can’t get enough of both the baking and that British humour! What are you looking forward to in 2018? Steph: A Mexico holiday where I plan on turning my phone off for 10 days, at least that is the plan! Kaz: Finishing off a laundry list of odd reno jobs around the house – 2018 is my year to get it all done! + The Stylephiles is launching an Instagram How to - E-Book, in early 2018. Pre-register here to get involved.